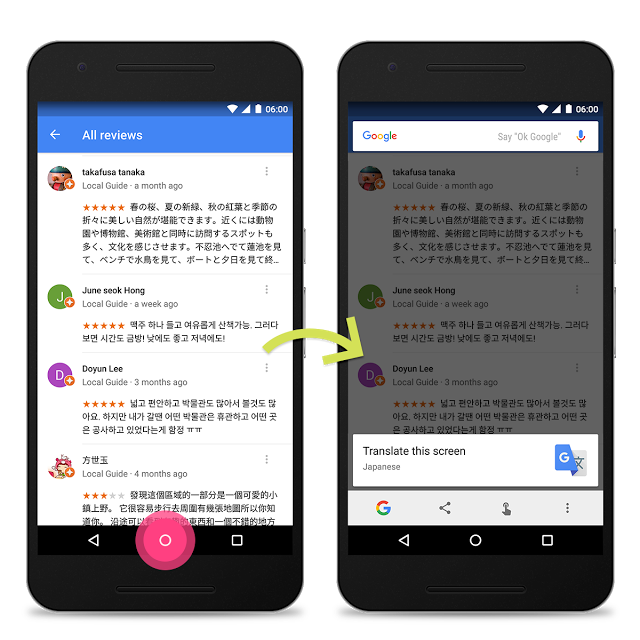 Building on a new text selection and search feature introduced last month, an update to Now on Tap adds the ability to translate foreign languages found in any app. On Tap can now also read QR and bar codes, as well as suggest interesting articles and videos as part of a new Discover feature. The new translation feature works from any app or webpage. Activating Now on Tap on a screen that contains a sizable amount of foreign language will bring up a “Translate this screen” card followed by what language is being translated. The Google app will then pop up the translated page in a new window. Unfortunately (but understandably), only the contents of that immediate screenshot are translated and not the rest of the page. The translate feature is currently available for phones with the language set to English, French, Italian, German, Spanish, Portuguese, and Russian, but it can translate several more languages, including Japanese. Last month’s update added the ability to officially use Now on Tap in the camera app to search for famous landmarks. On Tap can now recognize bar codes on packaged products and QR codes. Finally, this update adds a “Discover more…’ card for certain topics. Tapping it will bring a stream of articles and videos so that you can learn more of a topic. As with other Now on Tap updates, the new features are enabled server-side and already showing up for many users.